In 1987 and 1993, the National Department of Transport, South Africa, published manuals to address the needs of cyclists and pedestrians only. These manuals, however, became out-dated due to new technologies and developments in the provision of facilities for non-motorised transport (NMT). 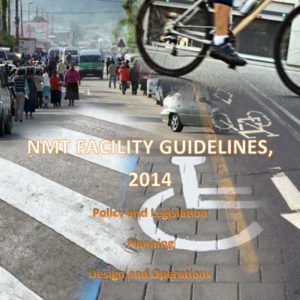 The NDoT decided to evaluate, review and combine these manuals into a practical and user-friendly “Pedestrian and Bicycle Facility Guidelines Manual” of 2003. SMEC-SA was commissioned by NDoT to draft a new NMT Facility Guideline Manual – a revision and update of the existing Pedestrian and Bicycle Facility Guidelines (2003) which does not seek to set out a new policy, but give effect to existing policy by providing guidance for a more balanced approach to the design of towns and cities for the benefit of NMT users. My work involved contributing to the guidelines (in particular network design and user-needs analysis, and stakeholder engagement). The main purpose of the new NMT Guideline is to provide guidance on the planning and design for safe pedestrian, bicycle, and other alternative low carbon modes of transport, both across and alongside roads and streets. Furthermore, the guideline will strengthen the provision of well-designed bicycle and pedestrian facilities and infrastructure to improve the physical environment and safety of NMT users.